1. Metal tub is rusting. Don't leave wet clothes sitting in washer after cycle in a tub that is rusting. Rust will transfer to the clothes. 2. Iron or manganese in the water supply: Avoid using chlorine bleach on rust stains. It will make them darker and more obvious. When iron is dissolved in the water, use granular detergent plus a non-precipitating water conditioner, such as Calgon or Spring Rain. 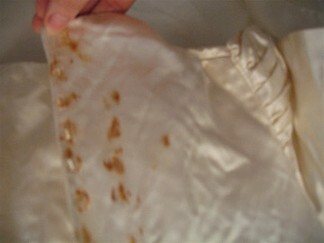 Better results may be obtained by dissolving detergent and water conditioner in the wash before adding the clothes. If the iron is suspended in the water (it will settle out), attach a rust filter to the faucet and inlet hoses or to the water line. If iron or manganese stains are a recurring problem, you may need a special filter or chemical feeder installed in the home to remove these minerals from the water supply. These may be removed by soaking articles in a solution of 1/3 cup RoVer and five gallons of water. Do not use a galvanized tub for soaking as RoVer will damage galvanized iron.